2 oz. Party Favor Jars are great for Parties of all kinds, for sweet souvenirs & for sampling unique honeys side by side We have combined 6 of our best different tasting honeys to give you an incredibly, unique, gourmet honey assortment. The 2 oz. assortment is on the right in the photo. The 3 oz. assortment is on the left. 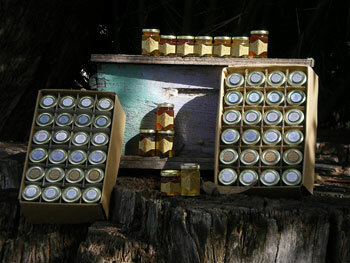 The free-standing jars of honey show the sizes next to one another for comparison. The shorter jar (2 x 2 x 2) is the 2 oz. jar. The taller jar (2.5 x 2 x 2) is the 3 oz. jar. This case includes: 4 each of the following honeys: Almond Blossom, 5-Star Star Thistle, Orange Blossom, Sage, S.F. Bay Area Blend Wildflower, Wild Blackberry.